One of the present government's prime missions was to clean Ganga. It boasted of a flagship programme 'Namami Gange' but could not care to listen to the real fighter who was on fast since June 22 demanding concrete action to cleanse Ganga by not allowing industrial waste causing pollution and health problems to people. Environmentalist GD Agrawal, who suffered cardiac arrest, has passed away. He was administered a potassium and heart related medicine, said a doctor at All-India Institute of Medical Sciences (AIIMS), Rhishikesh. He was demanding steps to make Ganga ' aviral' (free flowing) and clean. The 86- year old former professor of Indian Institute of Technology (IIT), Kanpur, had been demanding a ban on all hydroelectric projects along the tributaries of Ganga. besides enactment of the Ganga Protection Management Act. Agrawal sent several letters to Prime Minister Narendra Modi who, in 2014, had pledged on the banks of Ganga in Varanasi that immediate steps would be taken to clean the river. But, as IIT-ians for Holy Ganga, a forum formed to preserve the heritage and ecology of the river, has rightly observed, the government paid no heed to his demands. 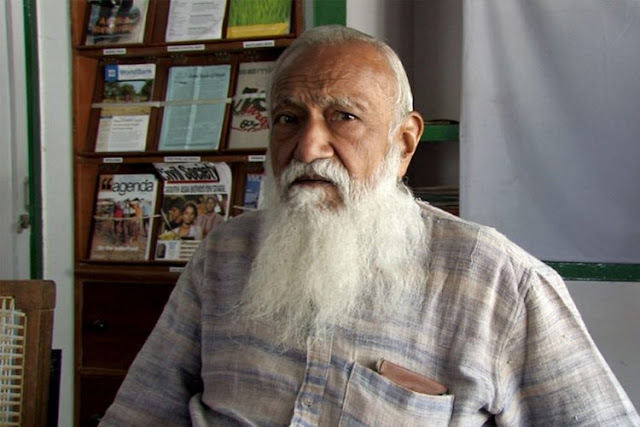 GD Agrawal, also known as Swami Gyan Swaroop Sanand, who was also former chair, Department of Civil and Environmental Engineering, IIT, Kanpur, served on the board of the National Ganga River Basin Authority and was the first member-secretary of Central Pollution Control Board. The government had also engaged him at various levels for advise on the health of the country's rivers. His demands included maintaining the environmental flow of the river to prevent pollution, removal of encroachments from the riverbank, and a special law to deal with the pollution of the river. In July, he was forcibly removed from his fasting venue by police and taken to an undisclosed destination. Later, he filed a petition in the Uttarakhand High Court stating that his peaceful fast did not pose law and order problem to the state. Many human rights activists, environmental experts and politicians have expressed their condolences. Activist Prashant Bhushan said that Agrawal passed away after his pleas to save the Ganga “fell on Modi's deaf ears”. He regretted “this world is not for pure souls”. Congress spokesperson Randeep Singh Surjewala said, "Rs 22,000 crore was allotted for cleaning it (Ganga) but not even one-fourth of it has been used." Aam Admi Party leader Sanjay Singh, Rajya Sabha MP, termed government as 'insensitive', adding,the BJP garnered votes on the name of Ganga but could not save the Son of Ganga (Agrawal). Even the ruling party members, including the Prime Minister and Union minister Uma Bharati (who vowed to clean Ganga) expressed grief, but their inaction and lack of political will is palpably visible. Despite fasting for almost 111 days, the government failed to assure Agrawal and could not stop him from fasting. He had tried his best but when he realized that the rulers are unmoved, he stopped taking even water and honey for the last few days, leading to his demise. Today, Ganga is smeared with blood of its loving son. Will the powers-that-be initiate any concrete step in future? Modi is not going to say anything about anything till election time except, of course, to bash Congress and Rahul. This has been his policy since 2014. If his party does as well as then, or better, he might start speaking up.